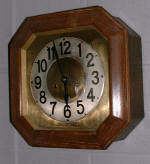 Oak cased German wall clock by The Hamburg America Clock Co c1920s. Eight day movement. 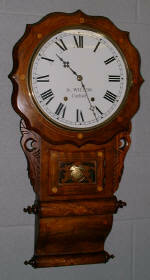 Clock originally sold by J B FRIDRICH of Sendingerstr Munchen 14. 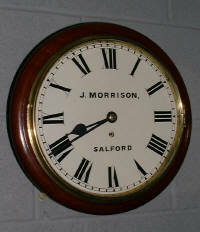 Anglo American drop dial Wall clock sold by JOHN WILSON of Carlisle. 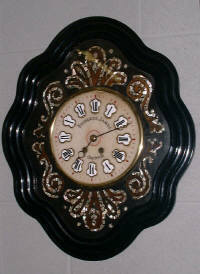 Late 19th c.
Black Forest wall clock. Wag on the Wall. 30 hour movement. Stag in repose in repousse brass square dial. Eight day movement by Astral. 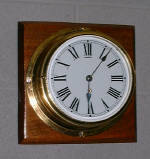 Single weight Vienna Style wall clock seven day movement. Case a later replacement. French Ox Eye Wall Clock by JAMES BOURGEOIS a' Charleville, Arden.c1890.Eight day movement strikes the hours & half hours on a coiled gong. Mother of Pearl inlay face. Some wood worm damage to face that has been treated. 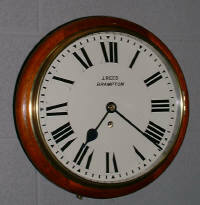 Astral ships clock with eight day movement c1920s. 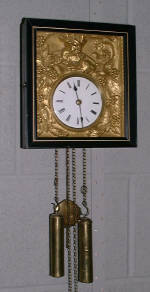 Double weight Vienna Wall Clock . Clock c1880s. Single piece movement with combined coiled gong. Wooden movement platform. Trapezoidal shape movement probably of Austrian manufactue. Heavy continental style of case. Some case and face damage consistent with a clock of this age.